I really like to shop. I especially like to shop for vintage items. I get more excited over vintage pyrex than most people do on their birthdays. I also enjoy crafting and bringing creativity into my life in any way that I can. Combining these interests means that by default, I LOVE ARC THRIFT STORES! They’re pretty much my favorite places on earth. If I’m not at home or at work, there’s a good chance that I’m at an ARC. Not only do they provide my vintage shopping fix, but they also do wonderful work in the community for individuals with developmental disabilities. ARC provides advocacy on behalf of these individuals at the local level, as well as in state public policy. They also provide family support, employment opportunities and a host of other services for people with developmental disabilities. This is a population that I love and it makes me want to support all that ARC does. Being creative can look a lot of different ways for me: sewing, writing, knitting, really anything crafty that shuts my brain off and allows me to create. I don’t have a creative job so I have to fill that creative hole in my free time. Lately, I’ve been finding ways to be creative and to hit ARC for some vintage wares, which also means that I can be crafty on a tight budget. These are exciting times for me, people! 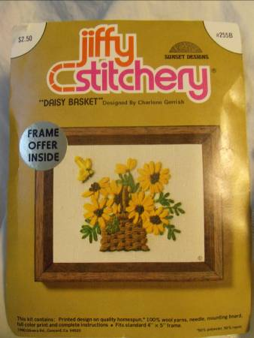 A vintage crewel embroidery kit for $1.99!!! Can you feel my excitement?! I snatched it off of the shelf before anyone else spotted my good fortune…though no one was nearby at the time. I get a little bit too excited about a great vintage find. Or so I’ve been told J One of the main tips I give to people that initially get hooked on thrifting is to dig deep. Sometimes the truly great treasures are hidden in the bottom of the pile or on the back of the shelf. But these treasures are absolutely worth the effort. 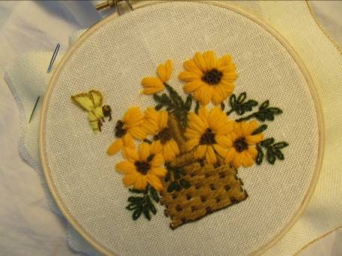 With this crewel kit, I quickly set to work figuring out the different crewel stitches. I love to cross stitch but I’ve never learned any other “real” stitches. I typically make up my own. But not this time! This time Jiffy Stitchery was going to instruct me properly. 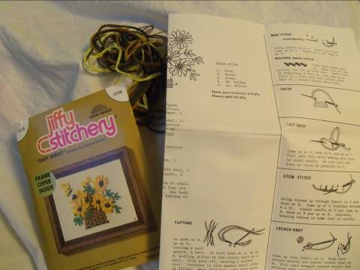 The kit had great instructions and all of the yarn and cloth I would need, as well as an embroidery needle. This was the perfect craft for me because it was relatively quick, and had such a great vintage retro feel to it. ARC came through for me again, big time. After just a few hours, spread over the course of a couple days, I completed my first vintage crewel craft. Drum roll please……. TAA-DAA!!! I love it! I was going to frame it but I think I’ll just trim it and hang it up still in the embroidery hoop. It’s so kitschy and retro; the bumble-bee is my favorite part. You’d think now that I’d gotten this out of my system I’d be on to a new creative endeavor, but I’m afraid all it’s done is fueled a fire. I am on the hunt for more of these fabulous vintage crewel kits! And there’s nowhere else you’d find me out hunting than at ARC. We are so happy to share this video with you all about this sweet young lady. Being a disabled girl is hard. Muscular Dystrophy prevents me from activities like running and ice-skating, and all the stuff that other girls take for granted. For once, I don’t want to be invisible or a side character that the main American Girl has to help: I want other girls to know what it’s like to be me, through a disabled American Girl’s story. The company seems primed to listen. This year they added hearing aids and allergy-free lunches to their accessories list, furthering a mission to create empathy. Normalizing disabilities is a step we’d like to see taken. Go, Melissa Shang! Watch her video, above, and sign her petition here.